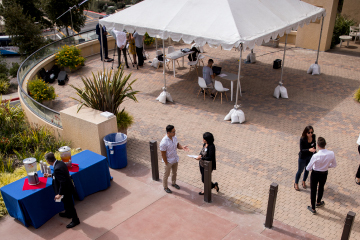 Two of Pepperdine Graziadio Business School’s Most Fundable Companies for 2018, nēdl and VFT Solutions, have announced a new partnership thanks to meeting at a Pepperdine Graziadio event last fall. VFT Solutions and nēdl, who ranked no. 8 and no. 11 respectively on the 2018 Most Fundable Companies List, met at the Most Fundable Companies awards ceremony in October 2018. Both companies participated in the Most Fundable Companies survey, a comprehensive assessment provided by Pepperdine Graziadio of their fundability and how they will be viewed by potential investors. After VFT Solutions heard a presentation on nēdl’s business model and technology at the event, the two companies realized that they had some potential partnership opportunities. nēdl (as in, the haystack), based in nearby Santa Monica, allows radio listeners to search live audio as easily as they search the web (by keyword) and also start their own live broadcasts to add their speech to the real-time search results. nēdl is the world's first search engine for live audio. VFT Solutions, based in Ellenville, NY, used its patented VLA® technology, to immediately identify and document illegal social media streams and viewers automatically, and even communicate with the streamer and viewers in real-time. This message insertion technology provides the viewers a message with a price and access-friendly option to watch the event legally. nēdl CEO Ayinde Alakoye added, "This partnership enables nēdl to add live performances to our rich content offering. We're excited to be working with technology that converts alt listeners to legal ones through our app." For more information, visit nēdl and VFT Solutions websites.